Move over Travis "Mad Dog" Maddox, there is a new underground fighter taking over the ring and his name is Remington "Riptide" Tate. "Real" is Katy Evan's debut novel, and she has hit the ball out of the park with it. 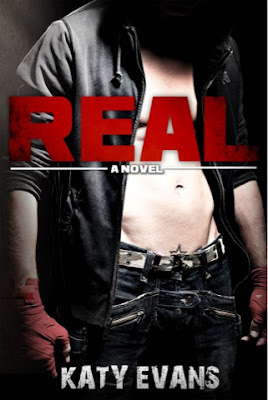 I give "REAL" 6 stars and that does not include the star that is tattooed on Remy's 8 pack abs. This book starts off with Brooke Dumas being forced to attend an underground fight with her best friend, Melanie. Melanie is obsessing over a fighter by the name of "Riptide". Melanie loves all of the excitement of being at the fight, whereas Brooke can not want to leave. That is until she got a glimpse of what all the ladies are yelling at then she understood exactly why everyone loved Riptide. Brooke Dumas, is an ex-track star whose future was changed in a blink of an eye while competing at the Olympic tryouts, when she tore her Anterior Cruciate Ligament (ACL). Then we have Remington "Riptide" Tate a/k/a Remy. From the moment Remy laid eyes on Brooke at the fight in Seattle, he knew he had to meet her. Remy immediately felt a spark inside of him that he has never felt. Remy sets his sights on Brooke and seeks her out and hires her as his physical therapist and brings her along traveling from city to city for his fights. Going from city to city, Brooke and Remy begin to get to know each other. Remy really likes Brooke, however he refuses to be an adventure to her. Remy is not good with expressing himself through words, therefore he communicates through his love of music. Brooke and Remy pick songs for each other to listen to which explain who they are, as well as how they feel for each other. Remy picks "Iris" by the Goo Goo Dolls and plays it for Brooke. I have to say when they exchange songs with each other, my heart swells. These moments are by far, my favorite scenes in the book. I don't think I will ever be able to listen to "Iris" without thinking of Remy. Brooke begins to peel the layers away from Remy's tough exterior and gets to know the person who has been hidden for so many years. Remy wants Brooke to see him for the man that he is, not the fighter "Riptide" that everyone sees. Throughout the book Remy and Brooke become each others rock. Sometimes we keep things from our significant others to protect them. Brooke gets herself into a difficult situation, when she is faced with trying to save her sister from a life that she isn't supposed to be in. Brooke comes up with a plan to try and save her sister, but she doesn't tell Remy what her plans are. By protecting Remy, will Brooke ruin everything she has with Remy? Remy's ONLY fear is losing Brooke. The question is, by Brooke keeping this secret from Remy, will it destroy him? Will Remy understand why she did what she did? I love how Remy is total alpha male, but he was never disrespectful toward Brooke. Yes, he was dominant, yet he handles Brooke with kitten gloves. It was great to actually read a book with a strong willed woman who knew exactly what she wanted. I found it rather refreshing to read a book with a female lead that actually had a back bone and was not indecisive with her decisions. I will scream from the roof tops, that EVERYONE MUST READ "REAL". I absolutely LOVED this book. This review was completed by Heather. GET YOUR COPY OF "REAL"